Stories which always end with the above statement are becoming more common. Surprise weddings proposals are extremely popular nowadays. While there are so many wedding proposal ideas out there, a picnic wedding proposal is the best idea you can use to make your fiancée say a hearty yes. 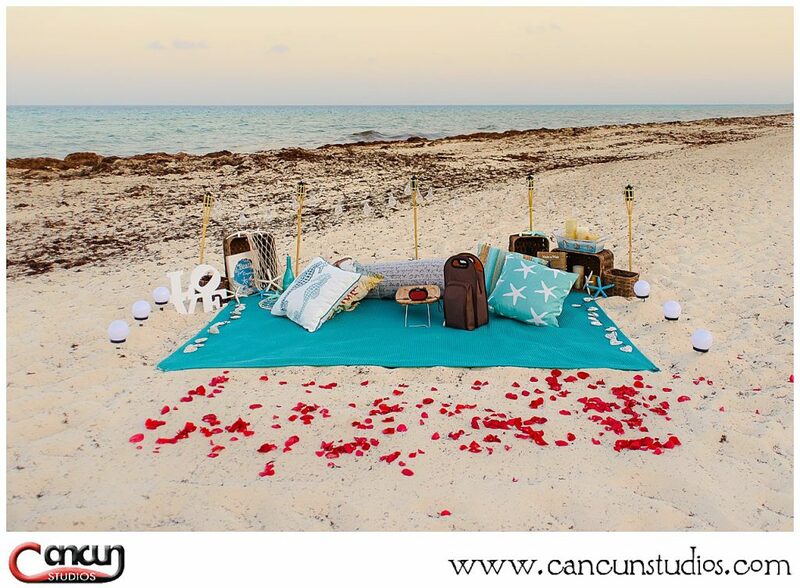 At Cancun, we have just the perfect idea for your picnic proposal. Romantic Picnic Proposal on the Beach, What Is It? Asking someone to spend the rest of their lives with you is a big step and you want to have the perfect scenario and place to do this. Proposing on a trip to a faraway place where just the two of you can share the moment is already romantic. But once you arrive to your destination, how will you go about it? The simplest things are usually the ones that stand out and are most meaningful. 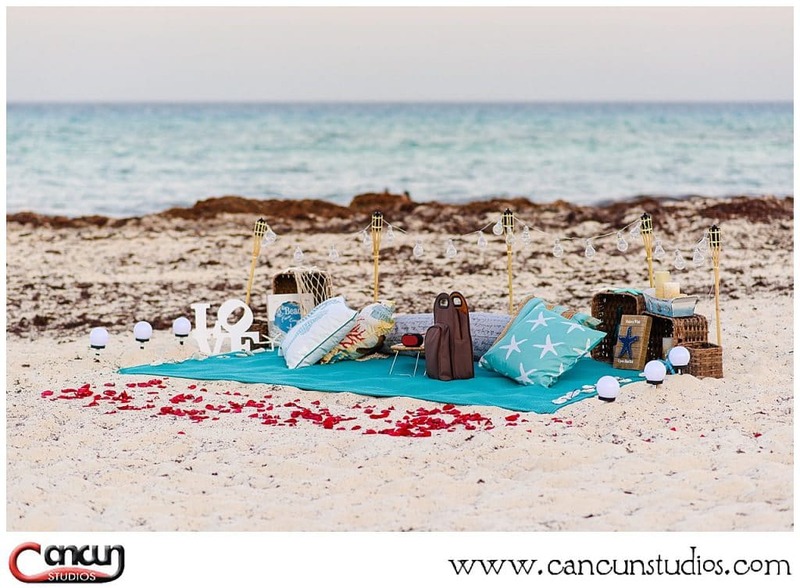 A Cancun picnic is the perfect setting on the beach to make your proposal perfect. You probably like visuals, right? 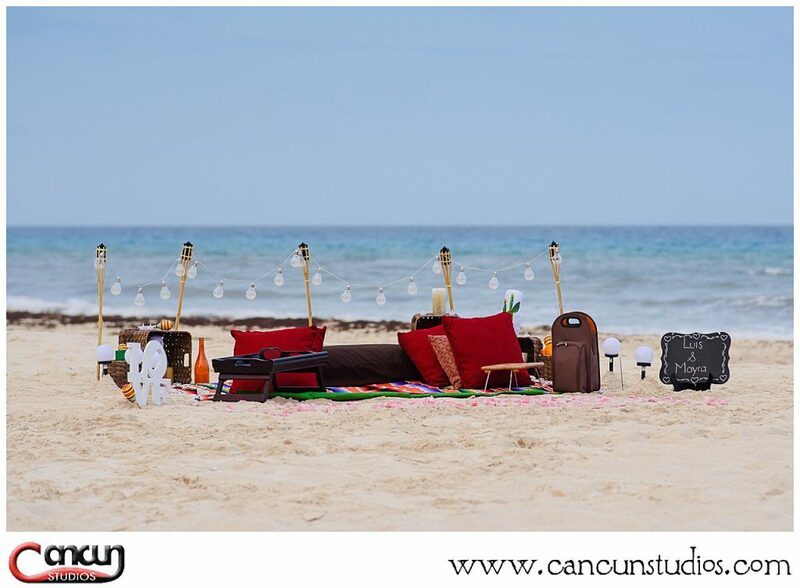 To see what we are talking about when we mention Cancun picnic proposal, check out our Instagram page. What Do We Include in Each Cancun Picnic? 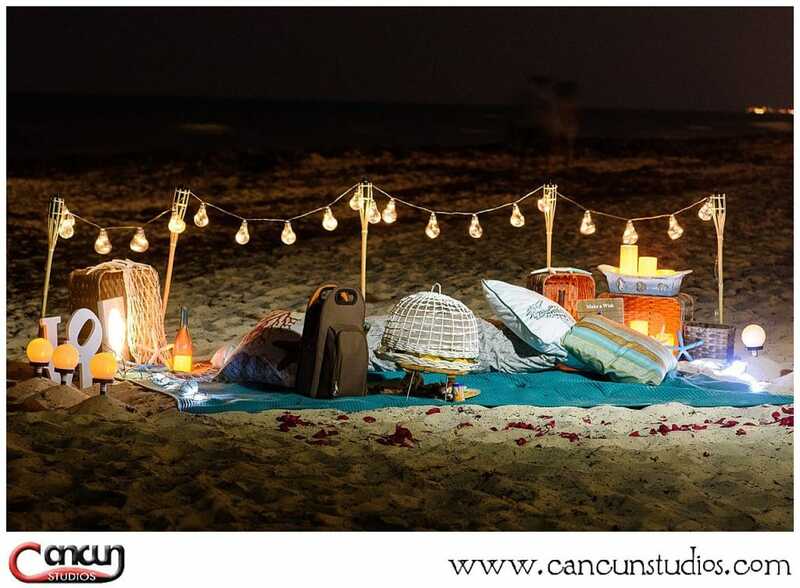 A romantic picnic on the beach will involve a romantic setting for you and your significant other. To set the mood, we will include twinkling lighting, pillows, a blanket and any other decoration you might need. You get to choose the theme you want. 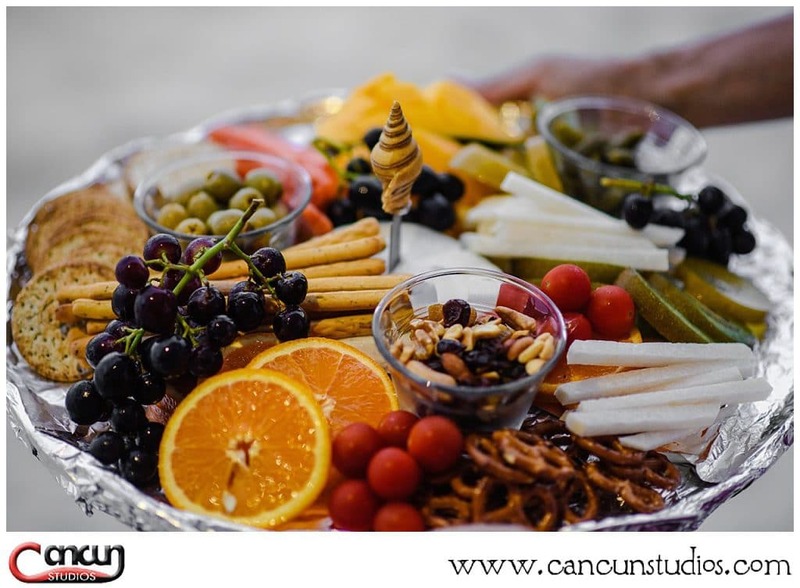 To make the Cancun picnic even more entertaining, we will include a mini speaker with a playlist of your choice, a wine bottle or a non-alcoholic drink and a gourmet platter you can nibble on. While the mini speaker could play your favorite playlist, a live musician feels much more romantic. 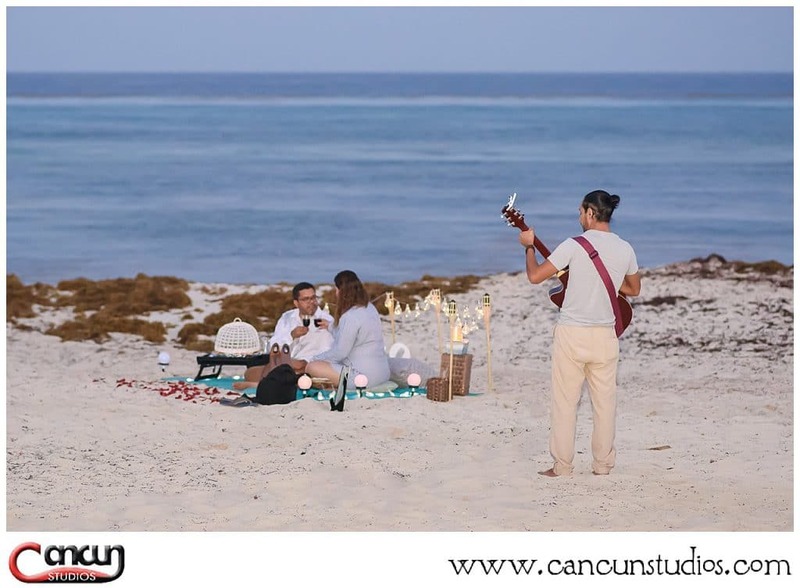 We will get you a great guitarist or a Mariachi group who will make your romantic picnic on the beach extremely entertaining. Fireworks are a personal favorite for many people. If you would like to celebrate your yes moment by firing some fireworks into the sky, we will provide information for these. Flowers have the ability to turn even a dull moment to a romantic one. If you prefer having a bouquet of flowers, we will have these ready. If you prefer just rose petals, these will be ready for you too. In Cancun, this is the first service that caters specifically to marriage proposals along with anniversaries and birthdays. Currently, we are catering only to the needs of two individuals. However, in the future, we plan on expanding and offering our services to larger groups of people. 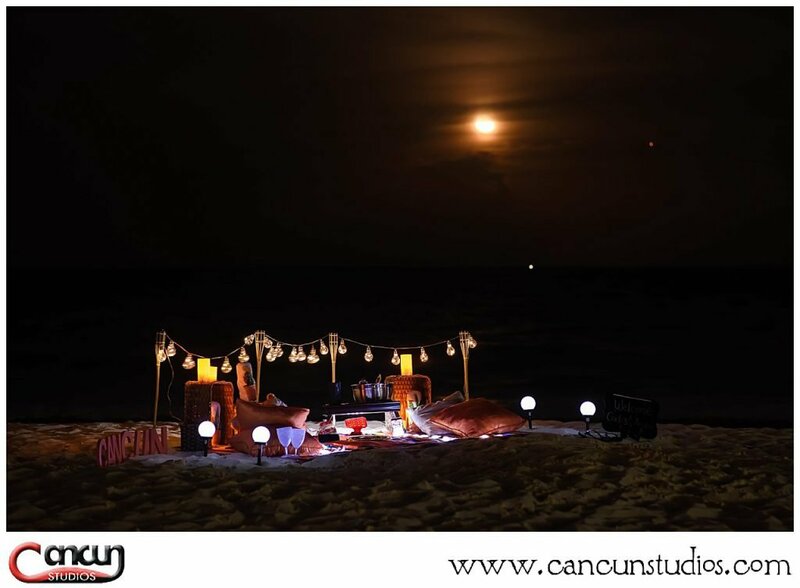 If you are planning on proposing, we would suggest a Cancun picnic proposal. Proposing while on a romantic picnic on the beach is something your significant other will live to remember. Ask about our other Marriage proposal ideas and services. We also have a qualifed marriage proposal planner to guide you with your visions.